There is an interesting story in Hindu tradition that explains why snakes have split tongue. 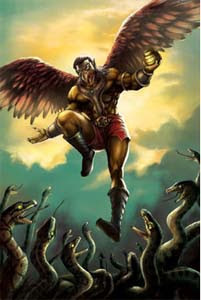 The story is associated with the famous rivalry between Garuda and Nagas (Snakes or Serpents). Kadru and her Naga sons cheated Garuda and his mother Vinita and enslaved them for life. Later the Nagas agreed to free Garuda and his mother, if he brought the Amrit, or Elixer of life, which was in the possession of Indra, the king of Devas. Garuda got Amrit from heaven and freed himself and his mother from servitude. He placed the Amrut pot on Durva Grass. But Garuda played a trick on the Nagas as he did not want them to become immortal after drinking the Amrit. After giving the Amrit to the Nagas, he asked them to consume it only after purification of the body. When Nagas went to take bath, Indra took back the Amrit. Nagas were disillusioned as they could not consume the Amrit. So they rolled on the grass on which the Amrit pot was kept. This gave them the ability to shed their skin and always remain young. Then they tried to lick the Durva Grass. The sharp blade of the grass split their tongues. From that day, snakes started having split tongues.